"Endless Summer" has undergone a total refit in 2009/2016 with all mechanical and electrical equipment having been upgraded or replaced with new, ensuring maximum safety and reliability. Zero Speed Stabilizers have also been fitted, providing ultimate comfort at rest. United Yacht Sales New Jersey would love to guide you through a personal showing of this 130' Westport Tri-deck Motoryacht 2001. 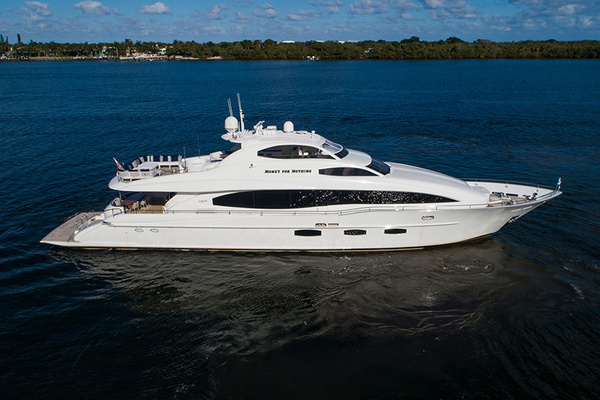 This yacht for sale is located in Fort Lauderdale, Florida and priced at $7,995,000. For a showing please contact us by filling out the form on this page and we will get back to you shortly! "Endless Summer"has undergone a total refit in 2009/2016 with all mechanical and electrical equipment having been upgraded or replaced with new, ensuring maximum safety and reliability. Zero Speed Stabilizers have also been fitted, providing ultimate comfort at rest. Boat Crane and Davits: Nautical Structure 2,000 lbs. "Endless Summer"has undergone a total refit in 2009/2016 with all mechanical and electrical equipment having been upgraded or replaced with new, ensuring maximum safety and reliability. Zero Speed Stabilizers have also been fitted, providing ultimate comfort at rest.The yacht's quiet acoustics while cruising are sure to impress along with the panoramic views from the extra-large windows of the Main Salon, Skylounge and Master cabin.Endless Summer’s main salon and dining room are located in the main deck and enjoy state of the art entertainment center with 42" plasma TV, iPod base for distribution of your favorite music everywhere on the yacht and pronto touch screen controls for all audio-video. A day head is located on this level. Further forward is the Master Stateroom.The remaining 5 staterooms are found below decks. On the large covered aft deck, guests can enjoy dinning and cocktails from the bar.The upper deck features an enclosed Skylounge. This popular gathering area offers spacious seating, game table and full wet bar, as well as, a large powder room. "Endless Summer" has a state of the art entertainment center with 42" plasma TV, DVD/CD and karaoke all controlled by pronto touch screen controls. The motor yacht’s Skylounge has access to the Pilothouse, as well as to the upper Aft Deck where lounge seating for casual dining and an 8-person Spa Pool are located.Her Flybridge provides large sun pads, seating for up to 14 people, a hardtop and 2 large umbrellas for shade, a wet bar with sink, refrigerator and a large BBQ, 4 bar stools and a pilot station. There is also a fore deck circular seating area, located on the bow, for sun-bathing or just enjoying fresh air. "Endless Summer"is a registered name and does not convey. Exclusions are to include but are not limited to, all owner’s and crews personal items. A detailed list of exclusions will be provided at the time of sale, upon written request.